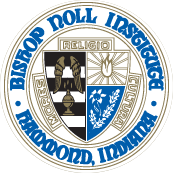 The immediate purpose of Bishop Noll Institute is education, understood in larger than purely academic terms. BNI seeks to reach young persons at a critical moment in their religious development, and uses this to help them explore their religious experiences in an environment where Catholic values are understood and experienced. BNI strives to become a center of academic excellence through the pursuit of each student’s intellectual development to the full measure of his or her God-given talents. The aim is not simply to get a store of information or to prepare for a job, though these are important in and of themselves. The ultimate aim is that of full growth of the person, which leads to action – action, especially, that is suffused with the spirit and presence of Jesus Christ, the Man – for others. This goal of action, based on sound understanding and enlivened by contemplation, urges students to self-discipline and initiative, to integrity and accuracy. Students learn to evaluate and integrate the many experiences they have through the family, the Church, work, media, entertainment and leisure. be more eager to find solutions than to criticize. The school community should be created and formed in ways which gives ALL its members responsibility for the whole – a responsibility of each member to make one another belong. Therefore, BNI is a community that aims at the unique fusion of Christian living and academic goals. In this spirit, the administrators, faculty, staff, students, and parents should have common academic purposes, but should also experience an opportunity to share in a community built to Christ. The joys, sorrows, problems and victories of one member of the community should be those of all the members as they work, play, pray, and celebrate the Eucharist together.